How to time your wedding photography for sunset? Timing is vital if you want great wedding photos. 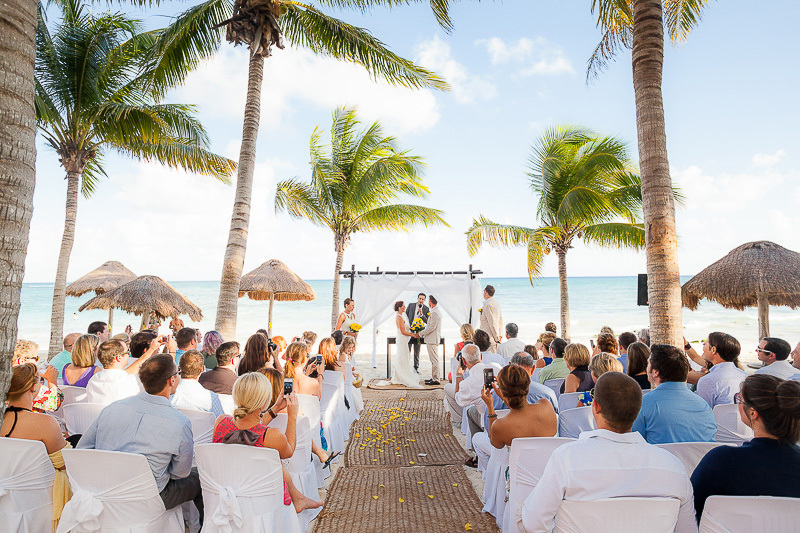 This is a MUST read for everyone getting married in the Riviera Maya! Sunset wedding photography is beautiful. The idea of saying “I do” just as the sun drops below a turquoise blue ocean and the sky turns from blue to a beautiful reds and oranges is a dream come true for most couples. The light is perfect, the air is cooler, the guests get to see you with the most amazing backdrop; what could be better? Well I hate to be the bearer of bad news, but beaches in Cancun and the Mayan Riviera face east and don’t provide these type of sunsets. And if you have your ceremony at sunset, by the time it is over and you’ve gotten your congratulation hugs, had that first toast and gotten a photo with your mom and dad, it’s dark. Meaning no time for photos!!!! If your goal is to have photos taken after your ceremony, then please re-think your sunset wedding ceremony. Have it earlier in the day and have a sunset dinner instead. It is equally as beautiful to sit outside with all your guests and have a wonderful meal as the sunsets over our lush jungle here in the Mayan Riviera, Mexico. We suggest that you have your ceremony END at least one hour before sunset. This will give you plenty of time to get great photos and if you have any concerns or questions about this, please do not hesitate to ask us and we will be happy to work with you on the timing of your wedding so that you not have a great ceremony, you also have great photos to cherish for a lifetime. The other option is to do your photos before your wedding ceremony. If you are OK seeing each other before the ceremony, you can always do your photos before the ceremony. Then you can have your ceremony at sunset and be with your guests for the rest of the evening. This is not a bad option, however, the one downside is that the hour before sunset is the best time for photographing. If you are doing it too far in advance it might be hot, bright and the beach could be a whole lot busier, so my suggestion is still an hour before sunset. Finally, read our post on Wedding Timeline Management. It’s a great read on why we suggest the one hour. Others might suggest more because they are not as experienced as me or as quick as me, or as organized as me, or maybe because they charge $350 an hour they want to make more money. Honestly, I don’t know why others want so much more time, but if you have the usual 4-6 people in your wedding party and have under 50 people at your wedding.. you don’t need more than an hour before sunset.